Thanks for the great response to our primary ice cream party last week! Several of you requested more specifics about the activities and games we did. I’m going to share the parts I was involved with, and then I’m turning this post over to my friend, Becky, who did a great job making and coordinating the rest of the games. I found the basic ice cream shape on the Silhouette Store and used my Silhouette to cut out the ice cream shapes and cherries for the game. 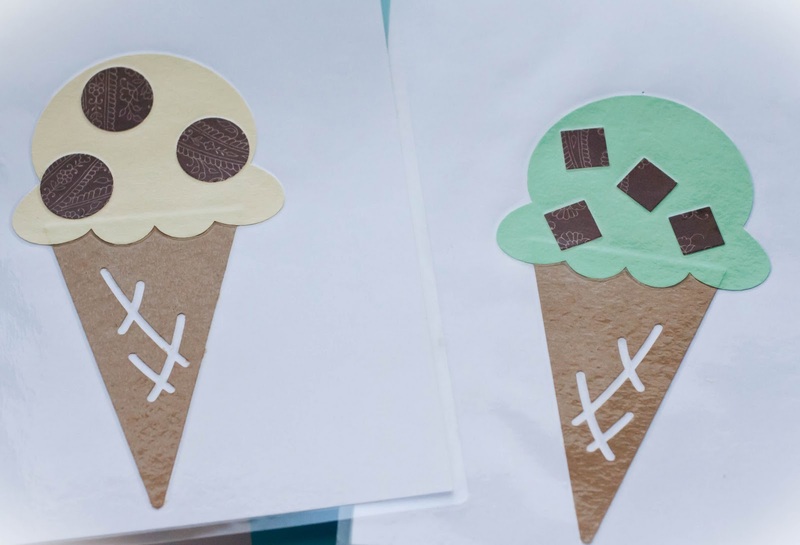 I used my other craft punches to make extra shapes to designate the various flavors of ice cream and then had them all laminated. Can you guess all of the flavors? The one at the top of the post is Neopolitan, then Cookies and Cream, Mint Chocolate Chip, Strawberry, and Moosetracks. (We also did Rocky Road and Chocolate Chip Cookie Dough–not pictured). We planned for 10 minutes to gather everyone at the beginning, and then had four 20 min rotations (keeping the party to 90mins.–nice!). 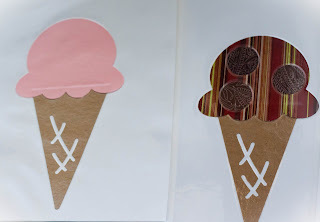 Each class had one rotation at the ice cream parlor, two in their classrooms, and one outside. Outside they played a life-sized version of “Guess Who” with another class. Each team would sit on opposite sides of a large curtain and pick a person to be “it”. The other team would have to guess who “it” was. The teams would take turns asking yes or no questions until they could guess who was on the other side of the curtain. It was a fun way to get to know each other better! And it gave them some time outside, so they didn’t go stir-crazy in their classrooms. Hi! My name is Becky Porter and I’m blessed to live just a few blocks away from Kendra. 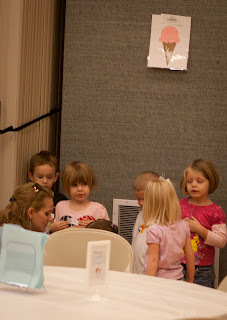 Occasionally I even get to work with her on a project or party such as our Primary Ice Cream Social. I know, I know–I am super lucky and I’m constantly inspired by her creativity. My assignment for the ice cream social was to provide a list of games for the teachers that they could play during extra time with their classes. Here is a sample of the games I came up with. These games have been tested and approved by my five children. A big favorite at my house that gets played often at Porter family reunions and is super easy to customize, Don’t Eat Pete is one game that never gets old and is about as simple as they come. The gameboard is a 3×3 grid of images. A candy is placed on each image (M & Ms and Skittles work great). Then, one player is sent out of the room while everyone else agrees on which spot on the grid is going to be “Pete”. The player comes back in and starts picking candies off the grid, one at a time, hoping to get as many eaten as possible before finding “Pete”. When the player starts to pick up the candy in the “Pete” spot, everyone yells, “Don’t Eat Pete!” and that player’s turn is over. The game gets played until everyone has had a turn. We also sent out a short survey by e-mail to the teachers to find out more about them. We asked them questions such as their favorite food, favorite color, favorite sport, and types of pets they owned. 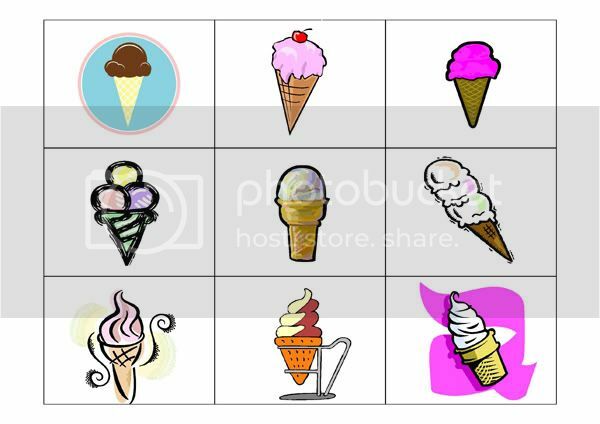 I compiled this information and used clip-art to make a memory match games. For instance, if the answers to the questions were pizza, red, basketball, and two dogs–I would create two 8.5×11 sheets of paper with a red splotch, two papers with a clip-art image of pizza, two with an image of a basketball, and two with an image of dogs. 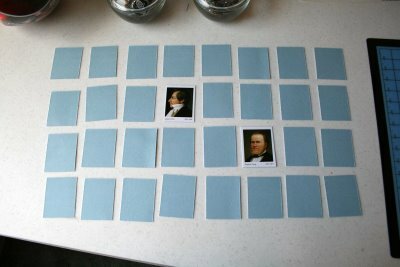 After printing the images they were mounted on cardstock and the game was ready to be played on the floor with the same rules as any game of Memory. We provided the materials for the Memory game, the Pin the Cherry game, and for Don’t Eat Pete. All other game ideas were compiled onto a list that we e-mailed out ahead of time and also had in paper form at the social. They were all simple, old-fashioned, and kid-friendly. Click here to download the list. Everyone had fun at the ice cream social and more than one teacher thanked us for providing the fun games. The great thing about these games is that they are easy to use for any party or family function. And, if you are looking for more kid-friendly ideas you can swing by my blog and check out this post here to get my directions for the latter-day prophets matching game I made for only $1. Thanks for reading my first guest blog post! I hope I was able to give you some ideas that will provide hours of fun with minimal stress. Thanks so much, Becky! These games are great and can be adapted for most any activity! If you throw your own ice cream party or other event like this for kids, we’d love to hear all about it! Thank you for sharing! Totally copying this party idea for our primary social next week. Any way you could share your printable of “primary is sweet”? It is very cute! I am primary president in the Garrison Creek ward in Kent, Washington. We loved your “get the scoop on your teacher” primary activity and are duplicating it for our upcoming quarterly activityJanuary 18th. I am trying to download the list of games given to the teacher and am having and can not get the link to open up on my browser. Is there anyway you can e-mail me the list of games. Thank you so much for sharing your creative and adorable idea. Next Saturday we are having our IceCrem Social. We LOVED your idea. I can not download your list of games that you sent to your teachers, can you please e-mail to me. Thanks o much. Sorry for my slow response. Thanks for letting me know about the broken links. My friend created those files and I am contacting her to see if she still has them. Hopefully we can get them to you soon, and/or fix the download. Thanks for your patience! Hello there! This is SO MUCH FUN! We are planning something similar, and like others, these links aren’t working. 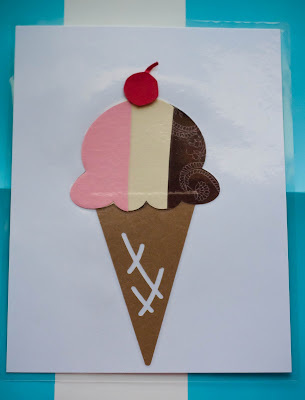 Could you email me the list of games you emailed to your teachers, and even the cute Ice Cream sign printable for tables and other printables you provided? LOVE IT ALL!!!! This activity is awesome and we are duplicating it as well ( a year later). I see the comments about the link that doesn’t work to the complete list of games that were played. The link doesn’t work for me either…Would you mind emailing it to me please? Our activity is in a month and I would love to have that! Unfortunately I don’t have access to those files anymore. I asked my friend if I could get them from her to re-post elsewhere and she didn’t have them anymore. Hello, thank you for getting back to me. I have one more question for you–Did you include your Sunbeams in all the same game rotations as your older kids? Or did you keep them separate? Also, how long were your rotations? Any tips you’ve got are much appreciated! I’m so grateful for your ideas here on this blog! Thanks in advance! to lessen the fats and cholesterol level. instead it’ll stfengthen the guts and entire circulatory system. When you possess a bowel movement it leaves your body, so you’re lowering your cholesterol without having done damage. too be more likely to the pores in the skin to acquiire clogged. guarantees about it particular treatment of cortisone. I began playing Hearthstone on mobile initial truly.